I started this post on Wednesday, but ran out of time to get it posted. So, I am finishing it up today and thought I may as well combine the two. Since it is thrifty too. Pretty much the only expense is the fun stuff you find to put inside. My littlest just had a birthday, we did a combined party with his cousin and did a spy theme. My mom did most of the work, making the cute top secret invitations, secret handshakes and codes. She even made them some brief cases with all of their spy gear. They had fun completing their missions which included, exploding the bombs(black balloons), disposing of grenades ( grenade water balloons) completing an obstacle course and breaking the bomb piñata. 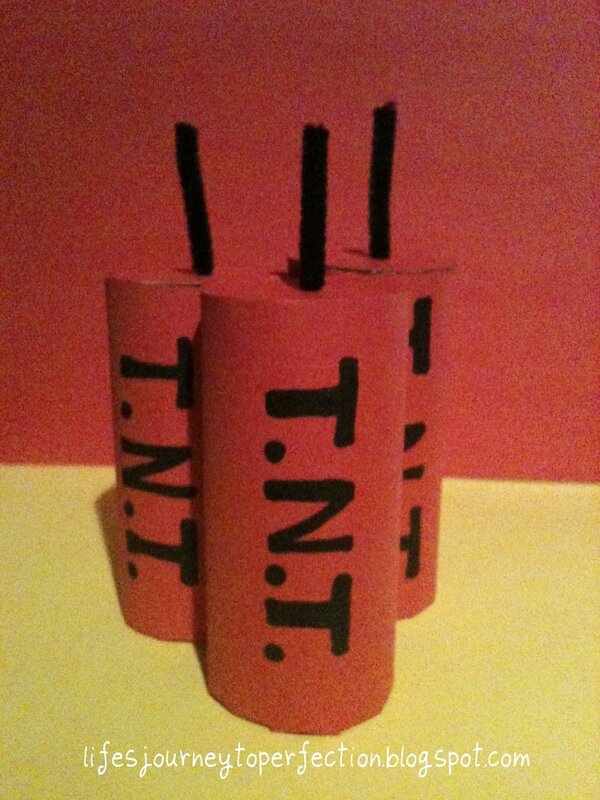 At the end they received their TNT dynamite favors. To make these you can basically use the firework tutorial found here, with a few changes. 1- Cut your paper towel tube. You can get 3 out of one tube. The lengths should be about 3.66 inches. 2- Cut circles out of cereal boxes the size of the bottom and tops of the paper towel. You can either trace them or us the pattern on the free firework printable found here. 3. Now this is where it gets a little different from the firework. You are going to glue one of the cereal box circle cutouts onto the bottom of the paper towel tube with some hot glue. 4. Next, you will need to cut some circles out of red paper that are larger than the tube, you can use the pattern on the free firework printable. Make little cuts into the circle. Using a glue stick glue it onto the bottom of the paper towel tube covering the cereal box circle. Making sure you fold down the overhang around the tube. 5. Now take some more red craft paper that has been cut to the length of the paper towel tub (3.66 inches) and wrap it all around the paper towel tube. I secured mine onto the tube with hot glue. You could use tape too. The dimensions of my red paper to wrap around the tube were 3.66 in x 6 in. 6. Here's the fun part, stuff the tube with little toys and candy. I also put some streamers in there. 7. Take another one of the cereal box circles and cut a piece of red paper the same size as it. Glue the red paper circle onto the cereal box circle with a glue stick. 8. Poke a hole in the middle of the circle. I used a small hole punch for this. 9. Push your black pipe cleaner through the hole. On the inside of the circle fold about 1/4 to 1/2 of an inch of the pipe cleaner over and glue it onto the circle with hot glue. Cut your pipe cleaner to the desired length. This is the "fuse". 10. Glue the circle with the pipe cleaner and red paper facing upwards onto the top of the paper towel tube. Don't put a ton of glue just enough to secure it. This is how they will get to their treat. 11. On the front write with a black sharpie T.N.T., you could also use vinyl, stickers or a stencil here. 12. Enjoy... To "explode", just pull on the pipe cleaner and the top should come off so they can get to all of their goodies.